Fishing was good shallow again today. We had a nice mess on 3 hours this afternoon. All were caught in 1-3 foot of water in and around brush on jigs and minnows. Fishing was very good today. This warm weather has the bigens biting. We kept 64 today and were being picky or could have had our full 75. We caught all our fish in 1'-3' of water around and in the brush. We had 2 big ones today one was a 1lb 14oz black crappie and the other was a 2lb 4oz white. Both were released to finnish spawning and fight another day. The fish are all over the place. Pick your pousn. Deep or shallow. Jigs and minnows are both working well. We caught a dandy mess Saturday in water 5 ft to 12 ft. Bass are in and in front of the bushes. Its going to get great in the next two weeks. My crappie on rend lake today were shallow. We flipped slip corks and minnows shallow for a big pile o crappies. Bass at rend are also shallow. Flip bushes and spinnerbaits shallow. 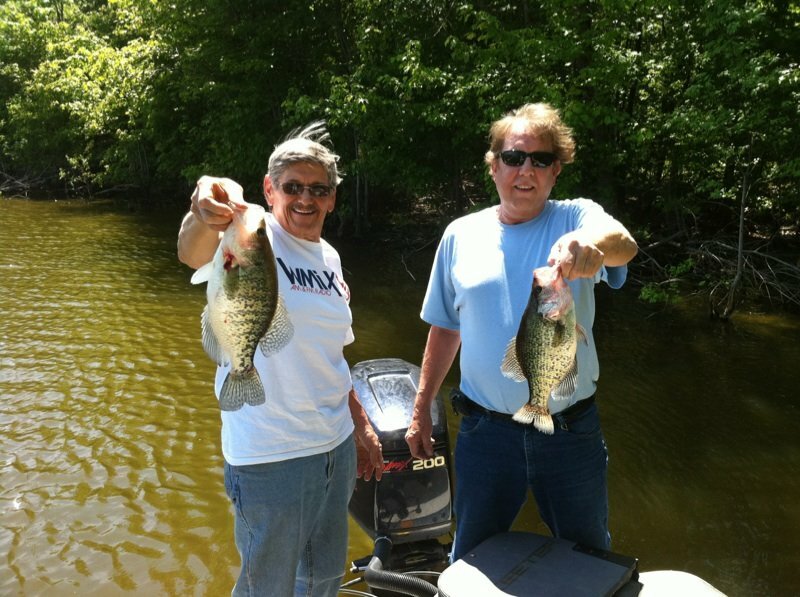 Egypt Crappie were a little slow on Friday but we still had big fish. They were from 4 FT to 20 FT. Minnows were best. Bass were Eating top water. Crappie are biting very good Wright the best way to get your limit is to fish in front of the buck brush with a jig and bobber or minnows in the last few days I have been seeing more gills being caught in the shallows also. The crappie are everywhere. We caught crappie shallow today on jigs. Minnow will still work best. Anything in 6 feet or less. Crag miles had a beautiful mess of Crappie in slightly deeper water. The fish are waiting to be caught.